The feature giving unique character to this property is a large mill room, still with its original stone work, now converted into a cosy living area complete with a fully functioning fireplace - overlooking the private pool and sundeck area. 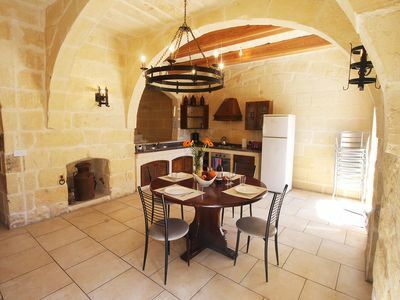 A separate kitchen lies off the living room and is equipped with traditional stone kitchen units, with its stone walls left in their original state. A wide modern glass staircase, a feature in itself, joins the living area with the bedrooms upstairs. The property sleeps six in three separate bedrooms, a double with one ensuite facilities, another double and a twin served by a separate bathroom in the hallway. All bedrooms have views of the well-known evergreen valley of Lunzjata, a popular walking spot with the locals. All the bedrooms are equipped with Air-conditioning that can be used both for cooling and heating at an extra charge. 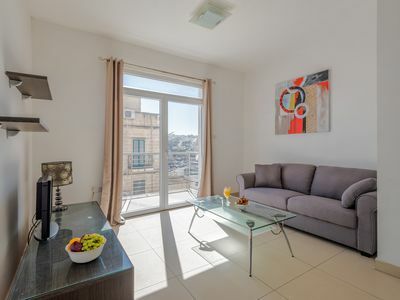 Please view our FAQs to view full maids schedule and other important information about what's included in booking and our Getting to Gozo section for information about Airport transfers and Car hire. Closest restaurant is situated 1.3km away from property. Closest supermarket is 1km from property. Here one can find restaurants to dine at any time of the day. Nearest beach 4km away from property. Local bakery is situated 1 km away from property. Kercem the village in which the accommodation resides is a small, with population of approximately 1,700 people. The property is situated in a very calm and tranquil area. The closest beaches are Xlendi and Dwejra bay where the famous Azure window was situated. The diversity of the island makes it unique, because of its size you are practically from one side to another in just 10 minutes. In the morning you could be visiting historical sites; like Ggantija, Citadella and enjoy the afternoon at the beach - The most famous of course Ramla beach with its red sand.